These videos are created by David Rutten. 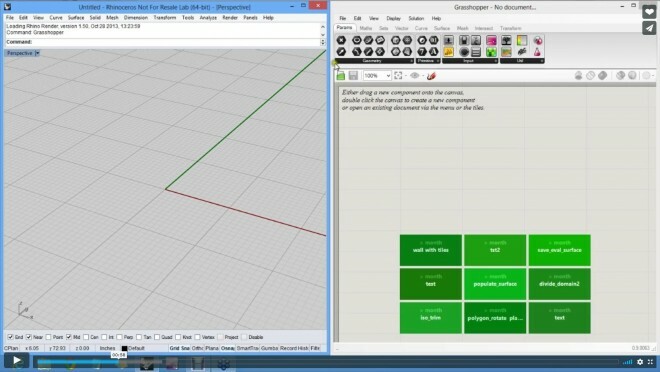 Interface Basics: Learn about the Grasshopper Canvas and create your first Grasshopper definition. Multiple Components: understanding how to link multiple components together. How to work with a series of components to create a solution. Refining a Definition: How to edit the model realtime. How can you change the original model and refine your definition as you work. Basics Questions and Answers: This part will help understand what we have covered so far. Creating Biarcs: The Biarc component is a great example of a function that exists in Grasshopper that would be diffcult to construct in Rhino. Displaying the Definition with Colors: Once you have definitions, you may want to use colors to highlight or inspect areas based on the different object Properties. This is an excellent way to visualize the data based on criteria you can setup. Lofting Multiple Curves in GH: Using Grasshopper to creating Surfaces through the dynamic curves is a powerful way to model. David has a few key tips to make the surfaces high quality. Creating Components with Custom Default: Here are tips and shortcuts in making new components already configured to your definition quicker and easier. How to get Support and find Samples: Want to know how best to get help, get your questions answered and find samples you can use in your own definitions? David reviews the Grasshopper website to show you the resources avalable. Using Multiple Inputs: Learn a great trick to make editing your definitions easier. This is invaluable as your definitions become more complex. Generic Components: There are many specific, task based componets in Rhino, but there are also many generic data handling components. Lists and Random: This example shows how you can use Lists of objects and a Random number generator to create some interesting models. Understanding how Rhino handles lists of Objects and values is key to creating your own solutions. Shortcuts Tips Working with Sliders: Still have questions. Here are various tips and tricks from David that may fill in some of the gaps.